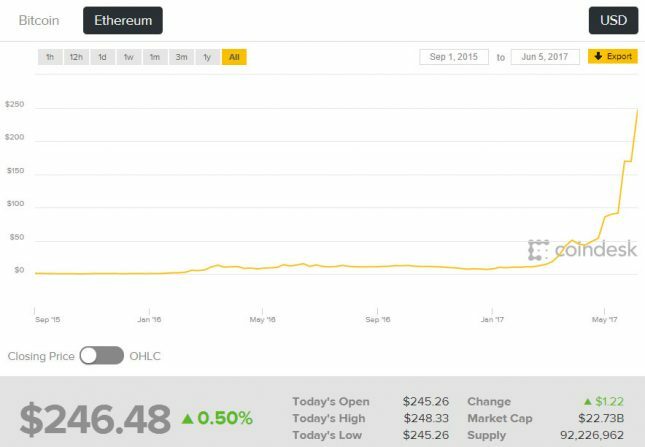 We’ve never done an article on GPU mining on Legit Reviews before, but continued interest in the ethereum project has caused Ether (the name of the cryptocurrency that runs on the ethereum blockchain app) to skyrocket in price by more than 2,800% this year alone. On Sunday, ethereum traded at an all-time high of $250.41, according to data from industry website CoinDesk. 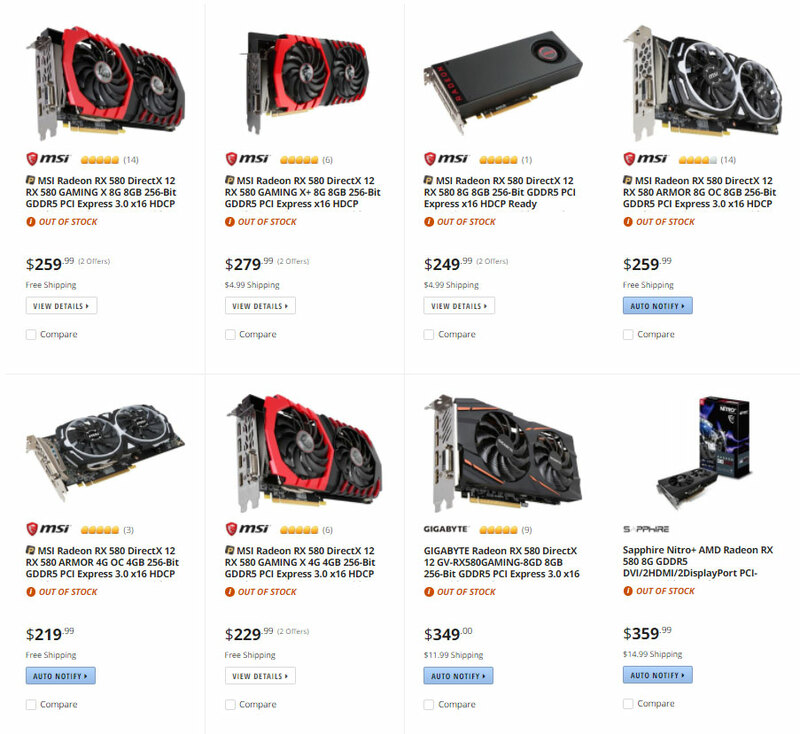 With increases and coin prices like that it has spiked the demand for discrete graphics cards in order to do GPU mining. Ethereum discourages the use of custom ASICs and FPGAs when it comes to mining, so this is something you could do if you wanted to on a PC with a powerful discrete graphics card. 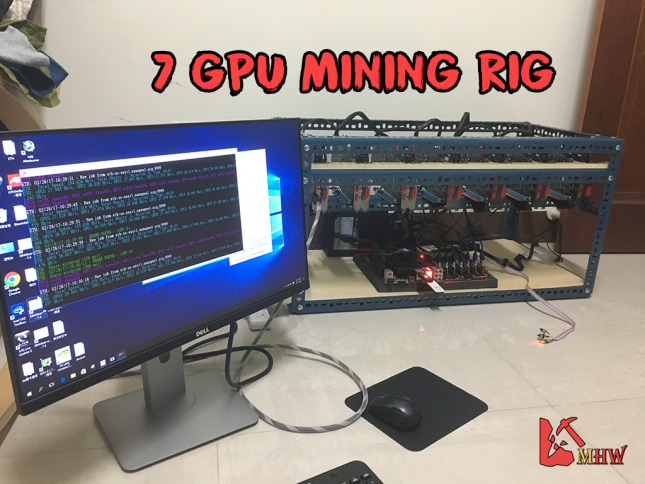 So, you want to building a mining PC? This is a quick summary of what you’ll need to get going. Motherboard: You’ll need a little luck and possibly some magic or a custom UEFI to find a motherboard that supports six to seven video cards. The Intel Z87 and Z97 chipsets for LGA1150 processors offer a pretty good bang for the buck as they are being cleared out to make room for the newer Intel Z170 and Z270 motherboards for the LGA1151 processors. Our favorite board right for GPU mining is the MSI Z170A GAMING PRO CARBON as it has the ability to run SEVEN GPU’s at a time when using the latest UEFI for $129.99 on Amazon. That board is starting to get hard to find, so alternatives would be the newer ASUS PRIME Z270-A at $139.99 shipped or the MSI Z170A Gaming M5 for $149.99 shipped. People are actually mining with eight video cards on the ASUS PRIME Z270-A motherboard thanks to an M.2 to PCIe 3.0 x4 adapter than can be had for $8.95 shipped. The ASUS Prime Z270-P for $105.99 shipped also works with 8 GPUs if you use two of the M.2 to PCIe 3.0 x4 adapters. Memory: Depending on what motherboard you got you’ll need DDR3 or DDR4 memory. Chances are you’ll need DDR4 memory and we suggest using an 8GB of memory. Some people say you can get away with single channel memory, but we’ve always run dual-channel in our mining rigs. A typical DDR4 2133 MHz 8GB (2x4GB) memory kit will run you about $59.99 from a big name brand. Storage Drive: Small and inexpensive is again the name of the game here. You likely don’t want to use a M.2 PCIe graphics card as some boards will disable PCIe slots when a M.2 PCIe SSD is inserted into the board. For that reason we suggest going with something like a low-cost SATA III SSD. The Kingston A400 120GB SATA III SSD at $47.99 or PNY CS1311 120GB SSD at $52.99 are hard to beat. If you don’t care about brand names or how easy it is to RMA if it breaks the DREVO Pro Series 64GB SSD at $39.99 shipped is cheap and will hold an OS. Riser Cards: Most go with USB powered 1x to 16x riser cards. These sell out often and they are mostly all made by companies that no one has heard of. The reviews on most are mixed, so you’ll just need to pick some and roll the dice. You’ll likely be paying around $8 each. Case: Get creative and make your own! Our favorite GPU mining builds are done using milk crates, some PVC pipes and zip ties. The might not look fancy, but they cost under $15 to make. Mouse/Monitor/Keyboard: Whatever is cheap! The AmazonBasics wired keyboard and mouse is just $12.02 shipped. OS: Windows 10 works and is essentially free, but ethOS Mining OS is a 64-bit linux OS that was designed just for ethereum mining and runs $39. Power Cord: Are you building multiple systems or plan on putting them in a garage or basement? You might need a heavy-duty power extension cord to get to the power outlet. Video Cards: AMD Radeon RX 470/480 and Radeon RX 570/580 video cards are all the rage right now when it comes to ethereum mining, but they are extremely tough to find since they are all being bought to mine ether. Since we couldn’t find any Radeon RX 580 video cards to purchase at Amazon, Newegg, Micro Center or Best Buy we figured we’d try mining on some of the cards we had laying around to see how they perform. Let’s take a look at the results on our system running Claymore’s Dual Ethereum GPU Miner v9.4 and Windows 10 v1703. The AMD Radeon R9 295X2 came out in April 2014 and is over two years old, but this Dual-GPU card is able to be at the top of the performance chart with 57.6 MH/s of performance. We’ve seen these selling for as low as $500 on eBay, but the TDP on this card is an awe-inspiring 500W, so packing 7 of these into a single system would be more than what any one power supply could handle. The thought of a single system pulling 3,500+ Watts is pretty crazy! 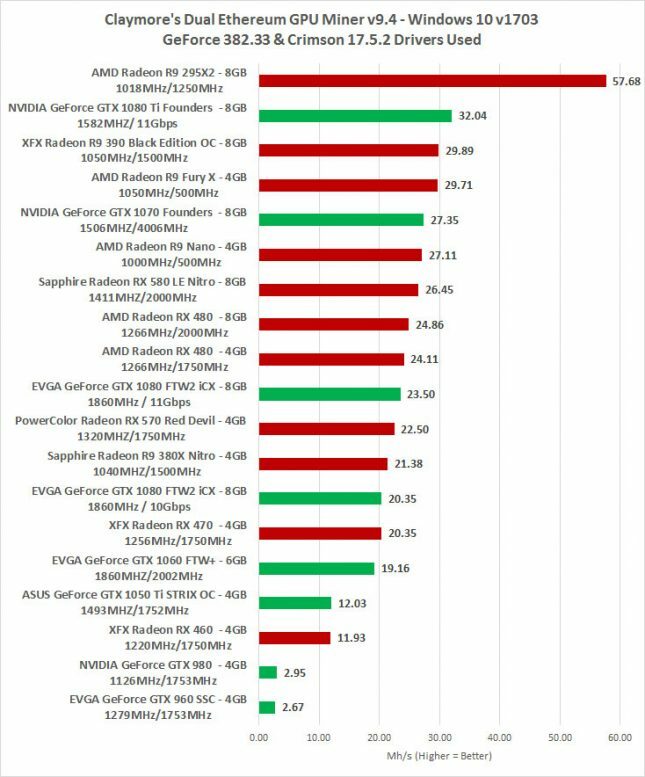 The AMD Radeon RX 480 and Radeon RX 580 are solid performing cards.When the AMD Radeon RX 480 first came out it the prices started at $199 and for that you get around 24 MH/s of performance ether mining in stock form, but you can easily get that up to 25-27 MH/s if you wanted to mod the BIOS and dial the cards in. You can reduce the power usage in AMD Wattman to get the power draw on these cards well below the 150W TDP rating. The new AMD Radeon RX 580 uses more power and costs more than the Radeon RX 480, but it gets higher performance and many are able to get 29 MH/s per card at around 135 Watts of power when you do all the widely known power adjustments. No wonder the AMD Radeon RX 580/570 cards are all sold out. When we saw the NVIDIA GeForce GTX 1070 getting 27.4 MH/s in stock form we were impressed, but then the faster clocked NVIDIA GeForce GTX 1080 with more CUDA cores only got 20 MH/s. We talked to NVIDIA about this and they said it’s because the Ethereum base code fits the GDDR5 latency characteristics better than GDDR5X. So, when it comes to Ethereum mining a GeForce GTX 1070 is better to have than the GeForce GTX 1080. That said the NVIDIA GeForce GTX 1080 Ti uses GDDR5X memory and is getting 32 MH/s. The NVIDIA GeForce GTX 900 series cards don’t mine well on Windows 10 and use a fair bit of power, so if you have one of these cards you’ll want to run Windows 7 or EthOS where you can get higher performance levels with older driver builds. You’ll need to do your homework if you want to mine on a GTX 900 series card and generate revenue! We could have talked about mining for days, but it really depends on what hardware you get and how you configure all your software. The AMD Radeon RX 580 and Radeon RX 480 are the cards to get right now, but it’s tough to find them. You can build up a rig like this for $2,500 or less and make an extra $1,000 a month at the current rates. We highly suggest looking at Ethereum profit calculators and factor in the build cost and electricity to see if mining is right for you! Let us know if you have any questions in the comments below! 6/14/2017 Update: A new article has been published that covers mining Ethereum on an NVIDIA GeForce GTX 1070 graphics card that is worth a quick look! We managed to go from 27 MH/s up to over 32 MH/s with some small tweaks! 6/16/2017 Update – We have now have an article posted on GeForce GTX 1060 mining for those that are interested in how that GPU model does. After tweaking the EVGA GeForce GTX 1060 FTW+ we managed to get over 22 MH/s with the card running so cool that the fans didn’t even run! 6/26/2017 Update – The MSI Z170 Gaming M5 is getting harder to find and we listed up some alternative motherboard choices. MSI is no longer producing or selling that model, so whatever is left in the market is it.